While one could argue that the show is already successful enough that this gesture to celebrities is unnecessary, I would argue it fits with the television industry’s general approach to social media, which is driven by the aforementioned sense of uncertainty. HBO and every other television channel or network continue to pump resources into this area because they don’t yet understand how sustainable social media can be for long-term growth. HBO knows Game of Thrones has a huge presence in social media, and knows this has value, but the perceived ephemerality of social media chatter—which changes minute to minute—means that another show could replace it at a moment’s notice. If HBO sees its social media presence as a lucrative space for drawing new subscribers, it also probably doesn’t have enough data to know at what point that presence can become self-sustaining, which results in campaigns that register as unnecessary but could theoretically be what keeps Game of Thrones on the “throne,” so to speak. To this point, I’ve suggested that this marketing effort is speaking less to the text itself and more to the fandom surrounding it, which BBC News recently outlined as the most powerful evidence of the show’s wide-ranging success. However, in watching the first four episodes of the third season (which I’ll “review” closer to their airdate, and hope to cover week-to-week time permitting), I’m wondering if it’s not so much that there is no relationship between HBO’s promotional strategy and the show itself, and more that the promotional strategy reflects an inherent challenge of any serialized drama. The fact of the matter is that Game of Thrones is not a show where “big” things happen on a consistent basis: much of the early part of each season is spent putting pieces into place, introducing (more) new characters, and telling bits and pieces of stories that may eventually reach a thrilling climax but will take a while to get there. This is true of any serialized drama (including AMC’s The Walking Dead, another show built around social media engagement), but it’s especially true with Game of Thrones’ highly fragmented narrative. Sometimes episodes feature only a single scene based in one location; in other episodes, entire locations are ignored and yet the attention of the episode is still split roughly seven different ways. It’s an arrangement that demands a degree of devotion from its viewers, in that more casual audiences might not have the patience to sit through a season premiere in which their favorite character doesn’t even appear, or wait for a resolution to a storyline they care about as it’s dragged out over the course of four episodes. Game of Thrones’ cultural appeal has been in its execution—pun unintended but not unwelcome—of big moments in its narrative, but its ongoing appeal depends on people being willing to wait for those moments, which will not appear in each and every episode. “Blackwater” may have been the second season’s greatest triumph, but it was also an episode that in its tight focus on a single location diverged from how every other episode of the show was structured. By encouraging intense engagement with the text on social media, it allows for shows like Game of Thrones to sustain a strong presence within those spaces even for episodes that fail to deliver the watercooler moments that would otherwise activate that discussion. To be clear, I am not arguing that the first episodes of the third season are unexciting, because the show remains one of the most compelling on television. 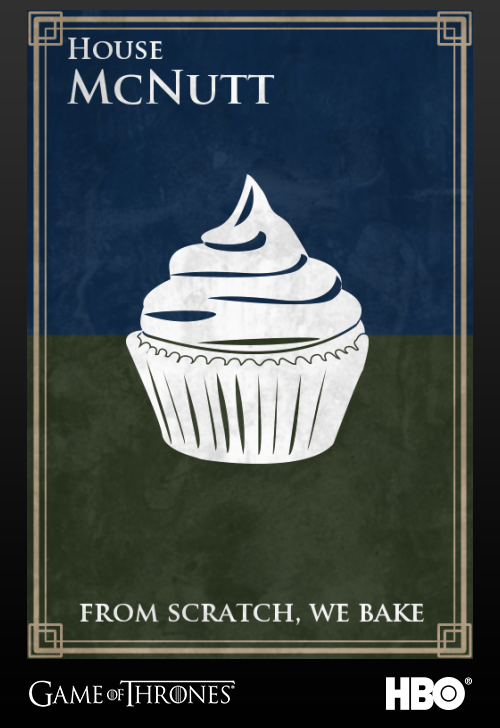 However, I find it compelling because I am decidedly devoted: having read the books, and written thousands of words about the first two seasons, and accidentally popularized an increasingly ubiquitous phrase, I have committed myself to the world of Westeros in ways that more casual viewers have not. It’s a commitment that many will make not through writing long reviews but rather through tweeting, whether with friends or with cast members or with critics, and one that could make each week’s episode—regardless of its number of beheadings—an event. 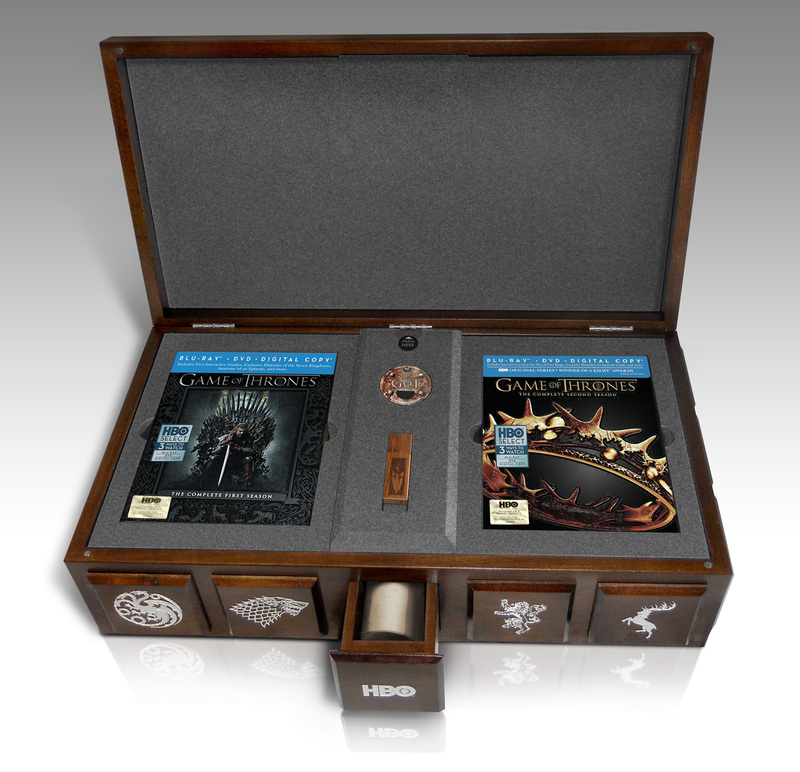 The Influencer Box was not simply designed to promote the process of watching Game of Thrones, but rather to promote the idea of engaging with Game of Thrones as though it were a part of your life. 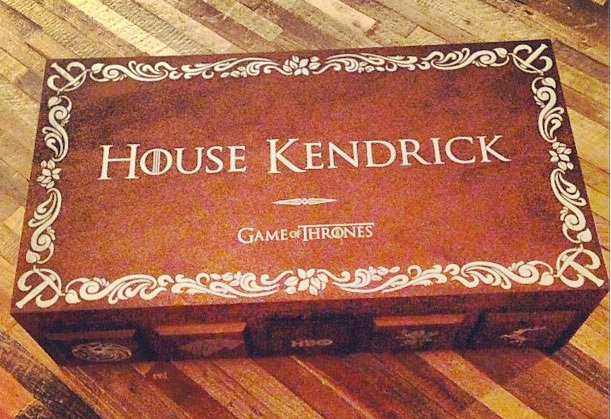 The customization of the boxes allowed celebrities like Anna Kendrick to place themselves into the series’ lineages—Kendrick’s sigil is a slanket—and gave them access to a level of fandom that HBO wants fans to emulate (even if they can’t get a customized box of their own, although see the edit below for how HBO hopes this will be facilitated). The fictional war that broke out between Kendrick and Patton Oswalt is the kind of performative fandom HBO wants to encourage. A recent online campaign, “My Watch Begins,” saw HBO urging viewers to record their own version of the Night’s Watch Oath, which would then be collected together as a united voice professing their devotion less to the cause of the Night’s Watch—I presume many of them intend to break at least a few parts of that Oath—and more to Game of Thrones as a cultural entity. Edit: As with the Scent Box campaign, HBO has gone and added an additional element that speaks to part of my analysis in the days following my writing about it. The “Join the Realm” website allows fans to create their own sigils, which mirrors the sigil creation that Kendrick’s social media chatter inspired, allowing viewers to place themselves within the show more readily (you can see mine to the right). It still doesn’t exactly match up with the customized boxes and the “influencer” logic, but it gives fans the tools to act on their creative impulses within a branded space, which is what the Influencer Boxes were designed to do within a specific celebrity niche. Of course, there’s no way of clearly measuring Game of Thrones as a cultural entity. Although Wired somewhat satirically outlined a number of ways we could measure television success in an age when the Nielsen ratings are proving more and more at odds with how people experience television, the fact is that even HBO won’t have a clear sense of how much a collection of personalized wooden boxes impacted their viewership or subscription numbers, and they likely won’t reveal such information even if they obtain it. But as companies like Trendrr begin to quantify social media use surrounding specific shows, and as actors throw out “Most Tweeted About Show” as a sign of success, the pressure to at least appear to be responding to those metrics is evident. And while Game of Thrones has had a strong Twitter presence since before the show premiered, and communities like WinterIsComing.net have helped cultivate Twitter as a productive space for fan activity (which the show’s creators commented on during a recent Q&A), the standards for what constitutes engagement are increasing as social media becomes less an added value and more an institutional requirement. The Influencer Box is HBO’s way of reflecting this change in how television shows use social media, going above basic interaction by using celebrity fandom to broadcast the popularity of their show to millions of potential subscribers. It also reflects how Twitter has become reconceptualized as a mass audience space. Between 2011 and 2013, the cultural impression of Twitter has shifted from a space where niche Internet users—and thus niche television audiences—congregated to a space where millions of casual viewers can be theoretically transformed into devoted fans. Whether or not this is actually true is a different question entirely (although see recent reports regarding the correlation between Twitter discussion and actual viewership), but the different messages of the two “Box” campaigns discussed here suggests two different conceptions of social media. Whereas the “Scent Box”—and the food trucks and other elements tied to it—distinguished Game of Thrones through a close attention to detail, the Influencer Box distinguishes through the bombast of celebrity; while we could simply say that HBO is looking to escalate its campaigns to continue momentum, the escalation could also reflect the fact that Twitter is—in the eyes of television networks, at least— no longer perceived as a space where nuanced distinction can be as easily or effectively communicated. As with most considerations of social media, we’re left with more questions than answers. I’d be interested to know if any celebrities who received the boxes chose not to tweet about them (which I know happened with the Scent Box). I’d also be interested to know if any boxes were sent to celebrities who hadn’t expressed their appreciation for the show, in an attempt to get them hooked. But above all else, I’m simply curious how HBO and other channels/networks will continue to evolve their social media strategies as the target of “engagement” continues to move. 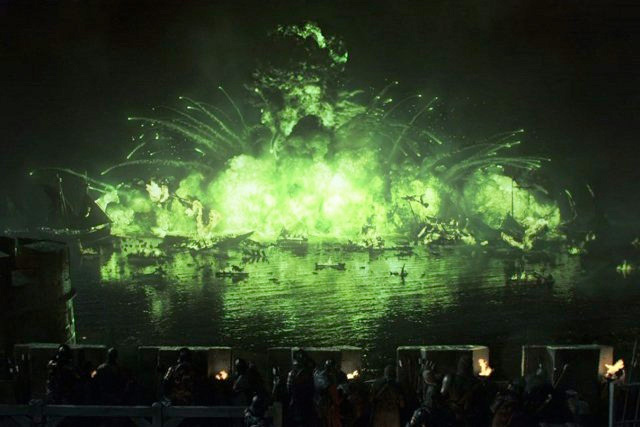 Although the Maester’s Path campaign reflected a desire to create a distinctive transmedia experience, the Influencer Box has introduced a mass media aesthetic to the principles of social media engagement; whether it has the desired effect will be something to watch, even if we still aren’t exactly sure where we’re supposed to be looking. Great post Myles. I wonder whether this kind of effort could be considered transmedia in the way it prompts viewers to implant Game of Thrones into their daily lives, as you mentioned. While it’s possible to see this as an attempted promotion for the brand image, it seems the potential this kind of promotion has to increase the story world for the viewer leads me to consider it as a deliberate effort from the creators to blur the line between their world and ours, Westeros and ontological that is, to extend the story across a variety of platforms, realities and spaces. As a result, I wonder what kind of impact this may have on approaches to transmedia storytelling if it is succesful. The reality is that I wouldn’t consider this transmedia storytelling. I mean, sure, it foregrounds the ability to “put yourself in the story,” but in a distinctly passive, entirely unguided way. It’s transmedial (which isn’t a word but should be) without being transmedia, if that makes any sense, in that it really is just actualizing something the viewer themselves could do. I forgot to link to it within the piece, but Mike Schur’s “fake” box (https://twitter.com/KenTremendous/status/312813321898299393) calls attention to the fact that anyone could put “House Last Name” on a t-shirt and get ostensibly the same feeling. What it does suggest, though, is that the logics of transmedia storytelling (the blurring of lines, the variety of platforms) are now being adopted within more traditional marketing spaces, albeit in what I’d consider a mass audience variation in which the actual experience of engagement has been simplified. The Influencer Box is a way to articulate fandom with an air of celebrity and engagement; real transmedia campaigns seek to create entirely new spaces for fans to explore and discover new parts of the story. This is great! Lets give celebrities with millions of dollars expensive limited edition gear for FREE! Its not like they could afford the gear so HBO decided to help them save some money because they are so low on funds and couldn’t purchase the boxes themselves. It’s entirely missing the point whether they can afford it or not. Miles’ article makes that abundantly clear. These objects have no intrinsic value to any of these celebrities (well, except perhaps Adrianne Curry — she seemed ridiculously happy!). Most of them would never buy them if they had the option of buying them, because they are meaningless to them if they paid for them. But _given_ to them, they’re a mark of “Hey, HBO thinks I’m influential enough,” and that certainly would be pleasing to many celebrities. And then they share this wonderful news with all their followers. Who have yet another reason to think Game of Thrones is cool or perhaps something worth watching if their favorite celebrity loves the show so much.